I love the ‘Gram I love the ‘Gram. I’m addicted to it I know I am I know I am. That’s Ingrid Thorburn (Aubrey Plaza) in a nutshell. Ingrid is an Instagram addict and has issues. By following the starlets of today on her app, she’s somehow convinced herself she is a part of their lives. Her most recent stunt comes as a result of not getting invited to a famous person’s party whom she believed to be her “friend” and the consequences of her actions put her in the mental asylum for a while. Fast forward to an undetermined amount of time, and Ingrid decides to go west to California to start anew after receiving an inheritance. Her reason for doing so is to meet and befriend the famous influencer Taylor Sloane (Elizabeth Olsen), whom she becomes enamored with after seeing in a magazine and liking/commenting on her IG posts. Slowly but surely, Ingrid begins to work her way into Taylor’s life and inner circle, receiving the attention and #BFF she always craved and would do anything for. The perils of technology and living in a world where everything is at our fingertips isn’t a new idea seen in film. Hell, it just happened recently with The Circle. But with Ingrid Goes West, it feels like the first time in which a film looking at the digital (specifically Instagram in this case) lifestyle does do with audience identification. Ingrid Goes West offers a pretty one sided and pessimistic view on social media, but it’s a view that, depending on the way a person feels about it, isn’t necessarily wrong. And it is a view that is certainly quite entertaining. Ingrid Goes West nails the ridiculousness of the Instagram scene. In his full length debut, director Matt Spicer embellishes the little things, like scrolling through a feed and liking every post without thought. Or, using an internal voice to mock the sometimes (read: often) self-important captions that attempt to be meaningful but really are anything but. Or, getting that right angle for the perfect gram photo. The Cali setting is an obvious, but fitting one for this cautionary tale of superficiality and carefully curated personas. Spicer traverses through a few genres in Ingrid Goes West, going from black comedy to satire to drama to romance and arguably even horror. Having this many genres can be problematic at times, but they all meld together here in a relatively short runtime of 97 minutes. Spicer’s script is sharp, with enough turns to make things unpredictable. As for how the film ends (no deep spoilers), the tone can be interpreted in a few ways, but I can’t shake the feeling that an opportunity was missed to be bold. Much of the success of Ingrid Goes West goes beyond the solid script. The fresh faced cast delivers in spades, starting with star Aubrey Plaza. This is undoubtedly the actresses’ best work of her career in a role that shows off her range. 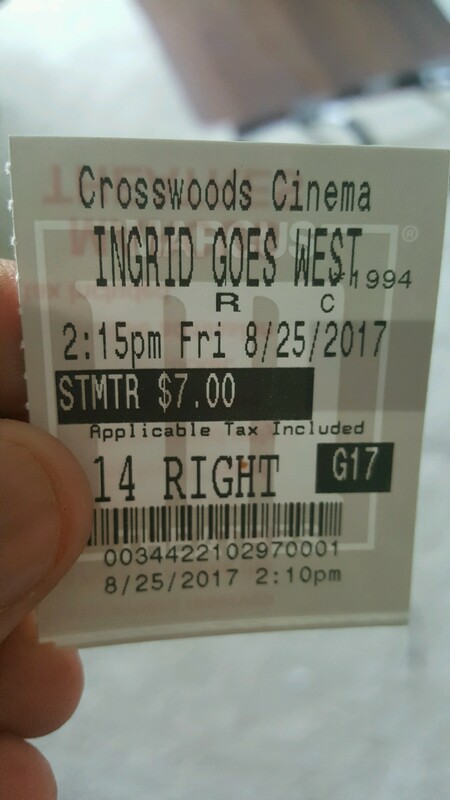 She is deliciously deranged, yet so relatable, probably because we all know people like Ingrid, or perhaps, may be Ingrid without knowing. As she goes deeper and deeper into the ruse formulating dark plans that seemingly spawn out of thin air, it’s uncomfortably funny and depressing seeing her downward spiral into oblivion. Elizabeth Olsen and Wyatt Russell also achieve in playing individuals who we may not know personally but feel like we do because of the transparency of social media. There are hidden levels of depth to their characters that both tap into effectively. With that said, most of the characters in Ingrid Goes West are hard to get behind…expect for Dan Pinto—the vape-smoking, Batman-obsessed, screenwriter-landlord who has some feelings for Ingrid, played by O’Shea Jackson, Jr. He’s easily the one character who is exactly who he is, with a touching backstory revealed mid-movie that explains his obsession with The Dark Knight. Hollywood, please cast him in more productions, as it is a crime that he’s hasn’t done anything since Straight Outta Compton until this. Ingrid Goes West tells a story that isn’t foreign, but a story that feels personal and certainly capable of making a person think about the next time he or she opens that Instagram app. Definitely worth viewing, no ragrets. Photo credits go to popsugar.com, dailymail.co.uk, and flickeringmyth.com. Hey thanks for the link! It sounds like this social media-driven flick is a step up from that trash The Circle. I’ve always had a soft spot for Plaza though, I’ve seen her in some really bad movies (excepting Dirty Grandpa, I wasn’t willing to stoop to THAT level) and almost every time I’ve found her really funny. Have you seen her in Safety Not Guaranteed? That’s my personal favorite performance of hers. I don’t think this is going to be around long, but I’d put it up there as one of the better comedies of this year in a very weak year for the genre. Just very dark at times.